"Sampath Speaking" - the thoughts of an Insurer from Thiruvallikkeni: Summer rains bring relief (!) or worry to Chennai !! Summer rains bring relief (!) or worry to Chennai !! The low voter turnout in Chennai, claiming to be a city of intellectuals is disgusting. There is another fickleness that comes to the fore…. !! Summer in Chennai is harsh – it gets hotter, sweats a lot and common man on the road suffers. There have been warnings that the mercury level would shoot past the 40 degree Celsius mark. At the start of the month, issuing a heat wave warning for many parts of the State, including Chennai, the Meterological department asked the residents to avoid the midday sun. In Chennai, the suburbs are hotter than the city. According to Met officials, heat waves are more commonly reported from Telangana and Andhra Pradesh during summer. It has hit Tamil Nadu too this year due to a sustained dry weather and lack of showers in most parts of the State, including Chennai. So, Chennaites were cursing the hot weather and in a trice, they are now crying – oh ! no more rains. Generally, the pre-Monsoon season is at its peak during the month of May. While many areas receive good Pre-Monsoon showers during this period, Chennai does not receive intense rains. During the months of April and May, strong weather systems with the capability of intensifying into a cyclonic storm form in the Bay of Bengal. The formation of these cyclonic storms are more frequent and intense during the month of May as compared to April. It has been raining now ~ it rained heavily last night and almost throughout the day yesterday. 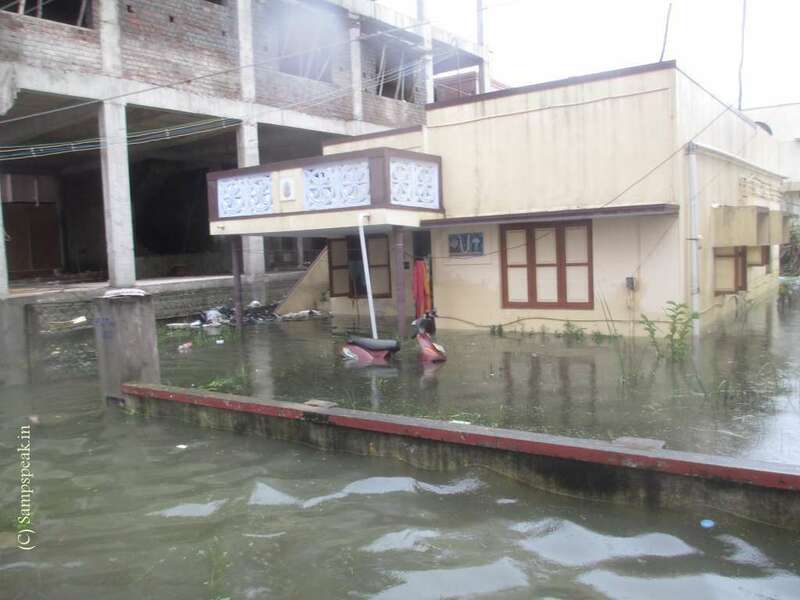 A low pressure area prevailing in the southwest Bay of Bengal has been causing heavy rainfall in parts of Kerala and Tamil Nadu, including Chennai, and the inclement weather would continue for the next two to three days. In Chennai, weather officials said the city received 67 mm of rain between 8.30 am on Monday and 8.30 am on Tuesday, the highest for a day in the month of May since 2010. 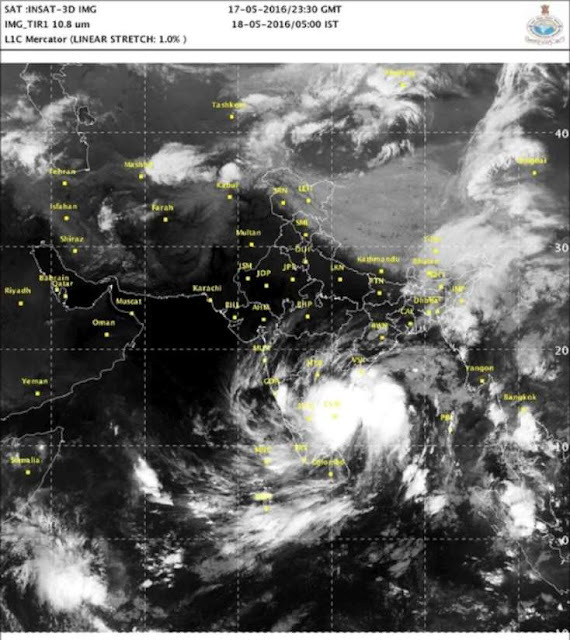 · The depression over southwest Bay of Bengal moved slightly northwards, and lay centred at 2330 hrs IST of today, the 17th May, 2016 near Latitude 12.5º N and Longitude 80.7 ºE, about 100 Kms east-southeast of Chennai. · The system is likely to move northwards towards north Tamilnadu south Andhra Pradesh coasts and intensify into a deep depression during next 24 hours. The system is likely to be closed to Chennai during morning hours of 18th May. Thereafter, it is likely to move north-northeastwards and further intensify into a cyclonic storm during subsequent 24 hours. · Warning: (i) Heavy Rainfall Warning: Rainfall at most places with heavy to very heavy falls at a few places with isolated extremely heavy falls over north coastal Tamil Nadu & Puducherry during next 48 hours. Rainfall at many places with Isolated heavy to very heavy falls likely over south coastal and interior Tamil Nadu during the same period. Rainfall at many places with heavy to very heavy rainfalls with isolated extremely heavy falls over south Andhra Pradesh coast during next 48 hours. Rainfall at most places with isolated heavy falls likely over Kerala and Lakshadweep during next 48 hours. Rainfall at many places with isolated heavy to very heavy falls likely over Rayalaseema and isolated heavy over coastal and south interior Karnataka during the next 48 hours. · (ii) Wind warning: Squally wind speed reaching 55-65 kmph gusting to 75 kmph would prevail along and off north Tamil Nadu & Puducherry and south Andhra Pradesh coasts during next 48 hours. Squally wind speed reaching 40-50 kmph gusting to 60 kmph would prevail along and off Kerala and Lakshadweep during next 48 hours. So summer rains – actually, it should please people who were suffering under intense heat. But Chennaites with fresh memories of Nov & Dec 2015, were expressing that rains are not good! This morning as I drove back, there was not much of water logging in areas of Madipakkam, Velachery, Guindy areas – many of which had been affected earlier – Insurers can heave a sigh of relief.